Below are some of my favorite pieces from SheInside.com and how I'd style them. 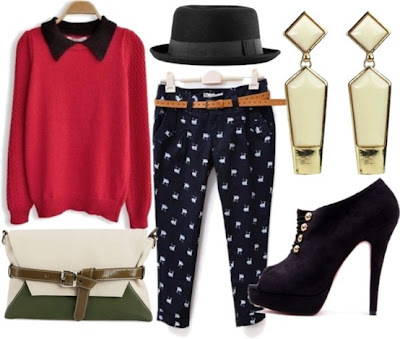 To shop these selections and more be sure to stop by SheInside.com! You added lovely details to this outfit. Pretty collar and love those leopard shoes. I love how you added the leopard flats. Unpredictable and stylish. Great outfit, Anna. Wow. I feel like we never see your hair straight. You look lovely. I hope you had a great weekend. This skirt and skit combo is amazing. Love this outfit! the skirt is so cool! super cute outfit! i just love that jumper! Pretty look. Love the sweater. The color is really beautiful and love your jewelery too. You always look so pretty and stylish! Gorgeous collar! you have the prettiest girly fashion! love it. the camel wool coat is amazing! Beautiful. I love the sweater!!! This outfit is so cute and love the knit! You look so adorable! I really like your rings- definitely will have to check out Posh Locket now and go on a jewelry spree! Thanks! Have a fabulous week! I have a very simmilar skirt but I never thought of styling it with a knit. Ohhhh, love your skirt and your collar! And the colour of your jumper....! Great photos! I think I just bought that same collar haha! I love love love all the outfits you made and especially the outfit you're wearing! The blue sweater is such a lovely color and you paired it beautifully with the skirt and accessories. :) Have a great Monday! Love the casual feel of this outfit! That cozy sweater is amazing for fall! Soo cute! Loving that skirt and collar!! This is a sweet look. Love the sweater! You look so pretty! I love the embellished collar and that skirt. Loving the mint green with the silver skirt! The embellished collar is also amazing. So beautiful!! :) I love your mint sweater Im looking for something like that lol! Love that outfit, so cute! Love the blue sweater! I think I'll have to get myself one the color is just perfection! This look is so cute! I saw that collar at H&M's website and it was one of my favorite accessories. It looks perfect with your sweater (which I love btw). Great look, Anna! eeeeep how precious are you?! I seriously adore this entire look... it's overall such a soft outfit with the pearl-adorned pastel sweater and flowy skirt, but I love how you amped it up with those leopard flats. So cute! Love your sweater and your skirt! Amazing combination! GREAT outfit! Loving that skirt! I love your color pallet. The shoes are so cute with aqua. I also love the first outfit you styled, very chic! So stunning, Anna. I love it. very cute! I love how you pair casual basics with such dressy pieces. I have the same flats from Target. Love them when they aren't hurting my feet. :) Also that nail polish…so pretty. Really cute! Love the full skirt with the sweater. I'm just waiting for it to cool down here so I can copy this outfit!. Love that geometric ring you're wearing here- you have such darling style! Love this look Anna! Such a cute Fall outfit. Aww! You look so adorable! I love how you paired that embellished collar with that mint sweater. So cute! I love that collar! especially with that mint cable-knit sweater! Love the look! Looks beautiful. I loved the rings very much. looking so preety i love style . nice ring . What a cute and quirky outfit. I think it's great. You are looking fabulous as always! Your skirt is adorable, obsessing over it! Such a cute outfit, I really love the silhouettes of your skirts!! Always something different and refreshing!! I love the black bag in the first outfit!